If there is one machine I dislike. It’s not that I dont like running. Or even that I was once overtaken by a bloke on crutches in the London Marathon! (that did nothing for my motivation at mile 19!). I see people in gyms, line of them. People WALKING on them, on an incline, holding on. Watching re-runs of the Jeremy Kyle show and endless motivational fitness quotes. 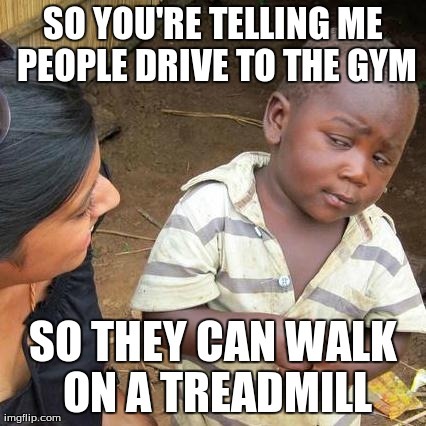 Most treadmill users DRIVE to the gym to use them TO WALK ON. Do you know where treadmills came from?? Well…they use to use them as a punishment (go figure). They use to sentence prisioners to go on a wooden step mill. Usually connected to a flour mill or some pump of some kind. Often is was connected to nothing and was loathed by prisioners (funny that). And…it was done in isolation. It was done to teach prisoners the value of hard work. Keep them out of mischief and deter others (it’s put me off already). So next time you got for a walk on a treadmill, just ask yourself what its really achieving? Its well documented that training on your own doesn’t yield great results. Training in a group or with a friend however leads to better adherence, quality of training and results. That’s what we do at KB3. HIIT Training tonight at 8pm, Pleshey…no treadmills.